When the brightest stars of the game convene in the Bay Area this weekend for the 2019 NHL All-Star Game in San Jose, Calif., they’ll be showcasing more than just their considerable skills. They will be sporting another example of the NHL’s commitment to making the world a better place. 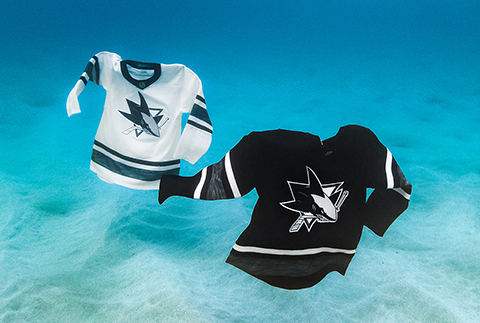 For the first time, players will wear jerseys made from recycled plastic material taken straight from the ocean. The monochromatic threads, an adidas special edition ADIZERO set made in conjunction with Parley Ocean Plastic, will be worn in both the Skills Competition on Friday (9 p.m. ET), and during the All-Star Game on Saturday (8 p.m. ET) that pits together the NHL’s four respective divisions in a 3-on-3 tournament. The eco-innovative and ocean-inspired sweaters featuring repurposed and upcycled materials give new purpose to the plastic waste that litters our oceans and beaches. It’s a perfect place to debut the jerseys, with the tech-savvy environment that San Jose boasts and its close proximity to the Pacific Ocean. “The NHL is a recognized leader in addressing major environmental challenges and preserving the roots of our game,” said Brian Jennings, NHL’s chief branding officer and executive vice president. “adidas has been an incredible partner in our efforts and shares our commitment to promoting sustainable business practices. 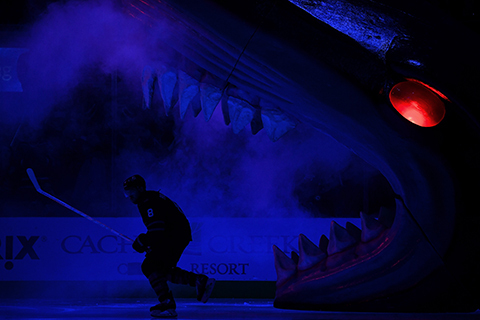 Created in 2010, NHL Green is aimed at transforming the game and reducing the league’s carbon footprint. Its initial foray into the world of environmentally-friendly practices was the NHL’s food recovery initiative, which takes all the prepared but unused food and donates it to local food banks. Now, a lot of the sustainability efforts have grown to operating within the NHL facilities, and advancing the agenda to benefit the community rink level. Omar Mitchell, the NHL’s vice president of Sustainable Infrastructure & Growth Initiatives, believes the best way to do that is to connect with fans and players alike, emphasizing why these efforts truly matter. One of those players is Alex Iafallo, a rising forward for the Los Angeles Kings, who recently picked up surfing over the offseason. On pace for a career-high in points, the Eden, N.Y., native noted the importance of the jerseys and what they represent. Iafallo and the Kings play in the Staples Center, which employs a dehumidification system that helps conserve energy in the Los Angeles-based arena. Iafallo gets what the league is trying to do, make sure the players are aware of the importance of these types of initiatives. It’s something that is evident each Winter Classic or Stadium Series outdoor event, when players enjoy talking about returning the game to its roots, and their memories of playing on a frozen pond or on an outdoor rink. “Protecting the places and spaces that we hold dear, which are frozen ponds and fresh water,” Mitchell said. “We have a lot of our efforts around water restoration, highlighting places to play outdoors, livable communities, that all aligns our values with adidas when they prioritize that commitment. One look inside NHL arenas will quickly demonstrate the league’s commitment to this cause. The SAP Center, home of the Sharks and this year's All-Star Game, are one of many rinks leading the push for sustainability. Their fuel cell system creates its own energy for the area. Among them is the shift to LED lights, which replace the tradition 1,000-watt metal bulbs. The LED lights, in addition to being used throughout the arena concourse, illuminate the ice surface and are 30-to-40 percent more efficient than their predecessor, using less energy. As an added bonus, they’re better from a camera perspective, hockey operations and player safety. More than half of the NHL arenas have adopted LED lights already, while the most are slated to do so within the next five years. 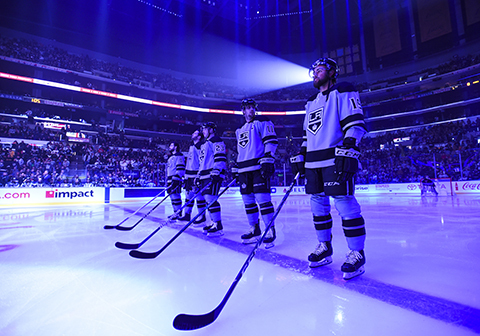 Other initiatives being adopted is the use of new dehumidification systems, like the blue ecosystem in the Staples Center where Iafallo plays, and the ice resurfacer water capture in Montreal. At the Centre Bell, all the water that scraps off the ice is recycled and saved back into the ice resurfacer, creating a closed loop system. At the SAP Center, the home of this weekend’s All-Star festivities, they have installed the latest iteration of fuel cell servers that create energy using natural gas, a highly efficient, 99 percent method instead of relying on energy from the grid and the suffering electricity lost through the energy transportation.